Catego for Cats is rated 4.3 out of 5 by 102. Catego® was designed specifically for cats and only cats. It is the only product with the unique combination of these three proven active ingredients: Dinotefuran, Fipronil and Pyriproxyfen. Patented applicator makes it easy to apply and minimizes the risk of skin abrasion. Available in 1-dose, 3-dose and 6-dose packs. Protection lasts for a full month with just one application. Rated 5 out of 5 by CINDY from EASY APPLICATION BOUGHT FIST TIME AT VET.OFFICE.IT WORKS FAST AND IS EAY TO APPLY TO MY CATS,I DON'T HAVE TO STRUGGLE WITK MY PETS.. Rated 4 out of 5 by Mcmmom from No ticks! My cat loves to be outdoors in the nice weather and he is usually very prone to ticks. I have been using this product for a year and it really works well to control the ticks. Rated 5 out of 5 by Black Magic from My cat loves this product Every other product I put on my long-haired beauty wold make her run around like I had put acid on her back- but NOT Catego. And, it worked quickly. She had scabs near her tail and they all started to heal within a week. She stays "scratchfree", even outside, for a month. Rated 5 out of 5 by Cessy from The only product that worked! This stuff got rid of our indoor cat's flea problem. Frontline and Advantage did nothing. I was ready to go crazy until I found this product! I was beginning to think we had mutant fleas. One dose and within a week we were cured (of course we treated the house, too). Rated 1 out of 5 by Lorne from Catego flea drops for cats I live in ne Tennessee. I bought a 3 pack of drops few months ago. Put one time on each of my cats. Fleas stopped for 3 or so days. Then came back in full force. This medication is useless. Rated 1 out of 5 by Beth from Not working ! Have 3 cats that. Had very few fleas. House has been treated but cats are still scratching. This is month 2 with this product. Rated 1 out of 5 by Jason from Vet recommended but does not work Took my cat to vet on Monday, who suggested this product. He did the application and send me home with another month supply. It is now Friday and I am still pulling multiple fleas off of my indoor cat. She keeps scratching, frustrated. Sad for the amount I was charged. What ticks does Catego protect against? Hello, Deb. Catego does kill flea eggs. Remember though, you may still see fleas since flea eggs can be deposited in the environment before you began using Catego. Consecutive monthly applications of Catego will help to halt the flea life cycle in your home. Because it takes a long time for fleas to mature from eggs to adults, three months of continuous product use is often needed to control fleas. All dogs and cats in the household should be treated with a flea control product, and year-round flea control is recommended to prevent re-infestation. For additional information on the use of Catego, and what to expect when addressing a flea problem, please contact our Product Support team at 1-800-999-0297 between the hours of 8am-5pm CT, M-F.
Is Catego FDA or EPA approved? RX required? Hello. Catego is approved by the EPA so no prescription is necessary. can i give my cat a bath a few days after using this? Hi, Laura! If you choose to bathe your cat between treatments, we recommend the use of a general grooming shampoo designed for cats. Please keep in mind that frequent bathing may prevent the product from working the full 30 days. For additional information on the use of Catego, please contact our Product Support team at 1-800-999-0297 between the hours of 8am-5pm CT, M-F.
Can Catego be used on the day a cat is bathed? Hello! After application, do not bathe for 24 hours to allow for complete drying of the product. If bathing before Catego application, make sure that your cat is completely dry before applying. If you choose to bathe your cat between treatments, we recommend the use of a general grooming shampoo designed for cats. Please keep in mind that frequent bathing may prevent the product from working the full 30 days. For additional information on the use of Catego, please contact our Product Support team at 1-800-999-0297 between the hours of 8am-5pm CT, M-F. Thank you for reaching out to us! Catego is available through multiple retail outlets like Petco, PetSmart and Pet Supplies Plus, as well as your local pet store. You can also find it at your vet's office or online. To find a location near you, just click the &quot;where to buy&quot; button on CategoCat.com. Hi, i have been using Catego for several months and always make sure i don't miss a dose. Recently i found three ticks on my cat. Can you please explain how Catego works, is it supposed prevent them from biting or do they bite then die? How long do we have to wait to give them a bath after applying the medicine? Hello, Lizz! Once dry, Catego remains effective for 30 days, even if you bathe your cat. After application, do not bathe for 24 hours to allow for complete drying of the product. If bathing before Catego application, make sure that your cat is completely dry before applying. If you choose to bathe your cat between treatments, we recommend the use of a general grooming shampoo designed for cats. For additional information on the use of Catego, please contact our Product Support team at 1-800-999-0297 between the hours of 8am-5pm CT, M-F. I used this on my cat and I am still seeing fleas that are alive and very active on him. I do not think that this product is working and I am not happy because I have spent days cleaning my house from top to bottom and my cat still has fleas. Hello, Trudy! Thank you for your question. No, there is no expiration date. Catego will remain ready for use as long as you store the product at room temperature, sealed in its original packaging. Thank you for reaching out with your questions about Catego. Catego does not require a prescription from your veterinarian. Before using, please consult your veterinarian. Hi, Carrie! After application, do not bathe for 24 hours to allow for complete drying of the product. If bathing before Catego application, make sure that your cat is completely dry before applying. If you choose to bathe your cat between treatments, we recommend the use of a general grooming shampoo designed for cats. Please keep in mind that frequent bathing may prevent the product from working the full 30 days. 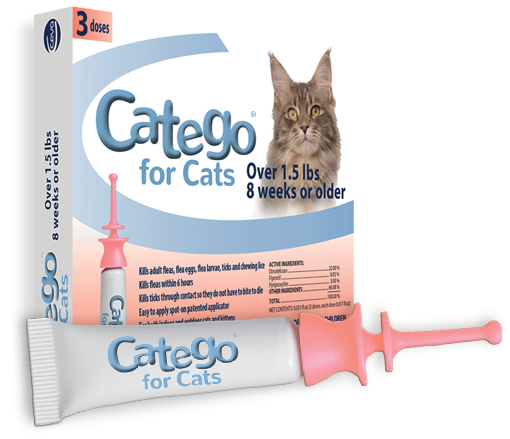 For additional information on the use of Catego, please contact our Product Support team at 1-800-999-0297 between the hours of 8am-5pm CT, M-F.
Can it be used on a cat that is nursing? Hi, Daisy! Before using Catego, please consult your veterinarian to make sure that Catego is the right product for your cat. For additional information on the use of Catego, please contact our Product Support team at 1-800-999-0297 between the hours of 8am-5pm CT, M-F.
Hi, County! Thank you for reaching out with your question. No, Catego kills adult fleas, flea eggs, flea larvae, ticks, and chewing lice. Please consult your veterinarian for the best treatment options for your cat. Hello, Mary! We do give out free samples from time-to-time on our Facebook page. Please be sure to follow us @YouLoveYourCatCeva or @CategoUS. Hi, Sue! Thanks for sending us this question. We would like to speak with you in order to explain how Catego works, so please give us a call at 1-800-999-0297. We're available Monday-Friday, 9AM-6:00PM ET. Will this product also kill ear mites? Hi, Jennifer! No, Catego does not kill ear mites. Yes, Catego does kill black-legged ticks (which are also known as deer ticks). Catego kills all life stages of ticks (larva, nymph and adult) on cats and kittens, including brown dog ticks (Rhipicephalus sanguineus), American dog ticks (Dermacentor variabilis), lone star ticks (Amblyomma americanum) and deer ticks (Ixodesscap ularis). How long should it take Catego to dry enough on my 2 year old female to put her back at play with our new kitten ? Hello, Bob. Drying time will vary, due to humidity, hair coat, the size of your cat, etc. Usually, Catego should be dry within a few hours. If there is any question of whether or not it is dry, you can touch the application site with a tissue to make sure it is dry. Please consult your veterinarian before reapplying another dose of Catego if it is within 30 days of the previous application. Regarding your flea issue; the fleas you see most likely started as flea eggs that were deposited in the environment before you began using Catego. It's important to treat the environment where your cat has been in order to get as many flea eggs and larvae as possible. Vacuuming your carpet and flooring, washing blankets/bedding and sweeping can help. There are also household sprays and foggers available at your local pet store if things get really bad. How long does product take to work on lice, will it kill the eggs. Catego kills adult chewing lice, but not the eggs. Depending on the amount of lice, it should work within 24-36 hours. We recommend that you keep them separated until the product is dry. This is to ensure they do not groom each other. Can this product be used on pregnant or nursing cats? As noted on our product insert, please do not use Catego on pregnant or nursing cats without first consulting a veterinarian. If you have any questions, please feel free to call our customer service line at 1-800-999-0297. How long after bathing do you have to wait until you can apply it? Can you apply it as soon as they are dry or should you wait 24-48 hours before applying? You may apply the product once your cat is completely dry. I have three cats, and they all need the Catego treatment. After I apply it, I should keep them separated, yes? Hi, Amanda! Yes, Catego kills chewing lice. It should be applied monthly, or as recommended by your veterinarian. How long should cats be separated from each other after application? I just put this product on all 4 of my cats exactly the way it is to be applied. My one cat some how reached the back far enough that she got it on her paw and of course licked it. What do I do???? Will she be okay?????? Accidental oral exposure may cause a taste reaction leading to some excessive drooling, or mild, temporary gastrointestinal upset if ingested. We recommend offering a taste treat to remove the taste of the product. How long must I wait after application to bathe my cat? You can bathe your cat 24 hours after application. We recommend a non-stripping shampoo, such as oatmeal or one designed specifically for cats and kittens. Visit our Facebook Page or check out our You Love Your Cat community. Catego® is a registered trademark of Ceva Santé Animale S.A.